Information about committees and governance is available on MARAC’s website (http://www.marac.info/) and the MARAC wiki (http://marac-operations-manual.wikidot.com). or if you would like to nominate a colleague. Kirsten Weld is a historian of modern Latin America. Her research centers on the 20th-century history of political and ideological conflict in the Americas, particularly during the region’s long Cold War, as well as on the politics of historical and archival knowledge production. 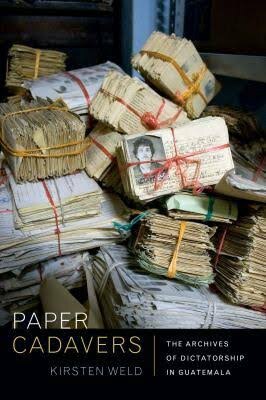 Her first book, Paper Cadavers: The Archives of Dictatorship in Guatemala, was published by Duke University Press in 2014. It is a historical and ethnographic study of the archives generated by Guatemala’s National Police, which were used as tools of state repression during the country’s civil war, kept hidden from the truth commission charged with investigating crimes against humanity at the war’s conclusion, stumbled upon and rescued by justice activists in 2005, and repurposed in the service of historical accounting and postwar reconstruction. Paper Cadavers is a broad meditation on how history is produced as social knowledge, on the labour behind transformative social change, and on the stakes of the stories we tell ourselves about the past. Following Dr. Weld’s lead, the Pine Tree Lecture Series takes up the archive as a central site of interdisciplinary intersections across academic communities and society. In response to the ever-expanding range of stakeholders in the fate and future of archives, this inaugural lecture is intended to be the first in a series of events that bring disparate individuals and departments together to discuss and reflect upon the impacts of archives on culture, society, and history. The Metropolitan Museum of Art Archives seeks an intern in the spring 2016 semester to gain hands-on processing experience and academic credit working with archival records held by the Museum’s Department of Photographs. Working under the supervision of staff in the Museum Archives and Department of Photographs the intern will assist with processing and drafting a preliminary finding aid for administrative papers which correspond to this collection and its curator, Pierre Apraxine. The archive consists of about 20 linear feet of correspondence, research files, financial documents, clippings, object files, artist files, acquisition and sale files dating from the 1970s to the early 2000s. Duties will include surveying the records and assisting with the creation of processing plan; performing basic preservation; rehousing and physically arranging records; entering collection metadata into Archivists Toolkit. Please note that processing of the entire archive will not be completed during the course of this spring 2016 internship. The Program Committee is looking for additional presenters for the following topics. See descriptions below for details and contact information. MARAC Pittsburgh will also feature pop-up sessions and a graduate student poster session–more details soon! Do you love MPLP? Hate it? Have stories of how it worked wonders or maybe was a total disaster? Looking to organize a lively debate on this topic. Contact Emily Cottle (emilyrcottle@gmail.com). Do you work with oral history collections? Have you started an oral history program? Then consider helping to run a mini-workshop at MARAC on starting oral history programs! This workshop will cover the main steps from defining the project’s focus and developing questions all the way through thinking about how to promote and use the oral histories once they’ve been transcribed and edited. Participants will leave the workshop with a step-by-step plan to start an oral history program once they return to their institutions. Contact Kelsey Duinkerken (kduinkerken@gmail.com). Many archivists, particularly lone arrangers, experience “scope drift” and end up being responsible for collections that fall outside the scope of traditional archives. For example, my title is “Archivist,” but I am responsible for all of the historic collections (art and artifacts included) at my institution. This session will discuss our experiences dealing with non-archival collections and how our training as archivists prepared us to take on the challenges of caring and making accessible other types of collections. Depending on the number of speakers, I would like to keep presentations short and make the session more discussion and question/answer based. Looking for 1-2 additional speakers. Contact Theresa Altieri (AltieriT@unionleague.org). We want to hear from you! Seeking Questions for Session 4 (S4) Mentoring New Archivists: An Open Exchange Session. Wish there was something you’d been told early in your career that new professionals will benefit from? Or maybe you’re a new archivist who has questions for more experienced colleagues? Join us in S4: Mentoring New Archivists: An Open Exchange Session, on Friday, October 9, 2015 (10:15-11:45 am) in Roanoke. S4. Mentoring New Archivists: An Open Exchange Conference sessions designed for new archivists can sometimes lack sufficient perspective or attendance from more seasoned peers. In this session, we bring together new and experienced archivists for an exchange of advice and ideas. A panel of archivists from a variety of institutions and backgrounds will offer prepared remarks on topics such as “what I wish I’d known” and “the best advice I ever got” before opening it up to questions from attendees. There will also be an opportunity for new archivists to submit questions in advance—watch the MARAC Blog for more information! Finally, the panelists will lead breakout sessions in which new archivists can ask questions in a smaller setting and experienced attendees can share their own advice. The archival institutions of the first state, Delaware, are excited to share the following news, upcoming events, and exhibits with our fellow MARAC members. Hagley Library has been awarded the James J. Bradley Distinguished Service award, which is given to a library or archive that has done great work to preserve motor vehicle resource material. The award is being presented in recognition of the Z. Taylor Vinson collection, which openned to researchers in early 2015 (http://vinson.hagleyblogs.org/2013/12/the-z-taylor-vinson-collection-open-to-the-public-on-january-2nd/). Also opening October 2, 2015, is an exhibit entitled, “Driving Desire: Automobile Advertising and the American Dream,” which will feature items from the Vinson collection. On view through December 15, 2015, in the information area of the Morris Library is an exhibition celebrationg the 25th anniversary of the Americans with Disabilities Act (http://exhibits.lib.udel.edu/exhibits/show/ada-25). On October 3, 2015, at 10:30 am, DPA is holding a program called The Life and Times of Ann Moore Ridgely. The presentation by Dr. Suzanne Fox is based on a collection of over 800 family letters housed in the Delaware Public Archives (http://archives.delaware.gov/outreach/publicprograms.shtml). On October 2, 2015, Winterthur will host New York Times bestselling author Andrea Wulf to discuss the life of Alexander von Humboldt, an explorer and scientist who can up with the idea of human-induced climate change in 1800 (http://museumblog.winterthur.org/2015/09/22/meet-one-of-the-most-colorful-and-captivating-men-in-history/). At the Conservation Center for Art & Historic Artifacts (CCAHA), where I am Director of Preservation Services, we don’t just clean and repair precious paper materials. We also help institutions, many of them archives and many of them in the Mid-Atlantic region, learn how to take care of their collections more effectively. Sometimes this is through ongoing relationships, like those fostered through the Philadelphia Stewardship Program, a William Penn Foundation-sponsored initiative designed to assist non-profit collecting institutions in the Philadelphia area in achieving their preservation and conservation goals for their collections over time. It is also through one- or two-day educational programs on a wide-ranging variety of topics related to collections care. 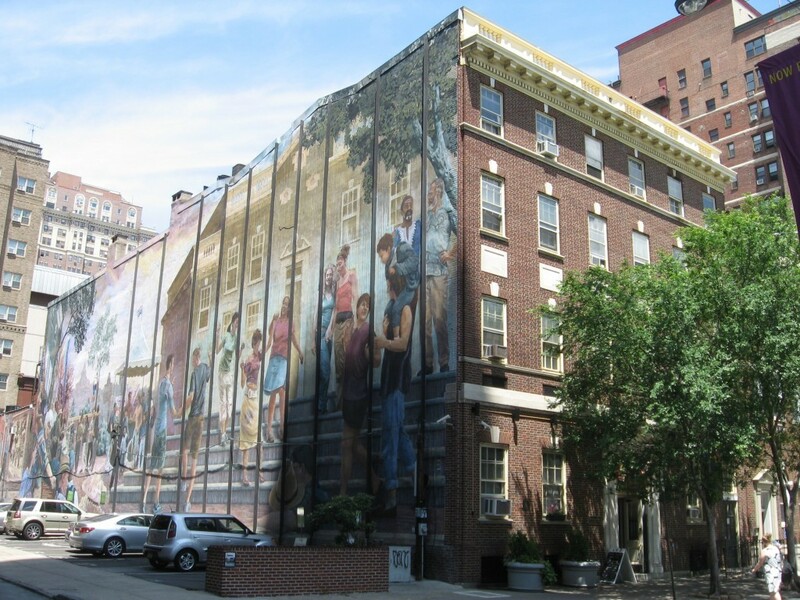 And sometimes it is through even closer, more enduring partnerships, like the one on which CCAHA embarked in 2014 with the John J. Wilcox, Jr. LGBT Archives at Philadelphia’s William Way LGBT Community Center (pictured below). The Archives, originally established in 1976, have been housed at the Center since 1997. The largest collection documents the 30-year history of the Center itself, but there are over 30 additional discrete collections documenting the history of the LGBT community in the Philadelphia and Delaware Valley region. collections. Among other important endeavors, the grant enabled the Center to create a paid staff position for Curator Bob Skiba, who previously worked with the Archives on a volunteer basis since 2006, and hire a new Archivist, John Anderies. The funds will also provide for a complete renovation and expansion of the Archives’ storage space, which will now include a dedicated reading room space for researchers. CCAHA were identified as project managers for the initiative, which will last through August 2017. “Day in the Life of: An Archivist.” By Ryan Kasley. Philadelphia Gay News July 2, 2015. “Archivist Keeps Alive Story of Gay Culture in Philadelphia.” By Melissa Dribben. Philadelphia Inquirer April 29, 2011.